Martin Grantham, SFSU botanist who formerly curated the restios collection at UC Santa Cruz, has visited South Africa, where these plants originate, and test grown some 100 different species. 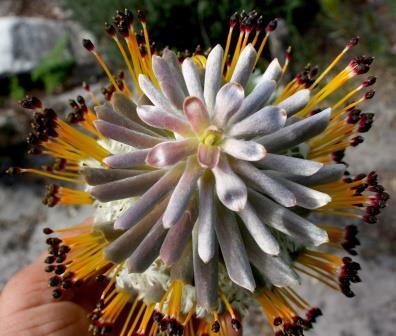 Martin’s presentation focuses on the plant families most closely associated with Fynbos communities, the Restionacae, or Restios, along with Proteas, Ericas, and a number of the more unusual, attractive, and grow-able plants. The Western Cape is one of the world’s 5 Mediterranean Climate zones, so the plants there experience summer drought. But the Cape has the highest rainfall of the 5 zones, so we must be selective of which plants we can successfully grow in California. Martin was born in pre-silicon Santa Clara Valley and took an early interest in botany, eventually studying the subject at UC Davis. He has done work for all the major botanical gardens in the SF Bay Area from field work and collection, through design, plant propagation, installation, curation, fundraising, volunteer coordination, you name it! One of his specialties is the Fynbos flora of South Africa’s Western Cape. He has traveled there often to study plants in the wild and has grown a broad spectrum of the characteristic plants, as well as some of the most obscure.